Interview by Mark Galli | posted 11/09/2005 09:00 a.m. 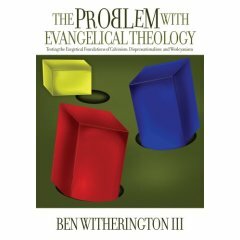 So, what is the problem with evangelical theology? It has exegetical weaknesses that are not recognized or owned up to by the various evangelical Protestant strains of theology. That’s what it boils down to. You write that in our distinctives, we are least faithful to the Word. What do you mean? The issue is not really with Christology, the Trinity, the virginal conception, the bodily resurrection of Jesus, or the Bible as the Word of God. The issues I’m concerned about are the distinctives of Calvinist, Arminian, dispensational, or Pentecostal theology. When they try to go some particular direction that’s specific to their theological system, that’s precisely the point in their argument at which they are exegetically weakest. The Calvinist system links the ideas of predestination, irresistible grace, and perseverance of the saints. Each of those has its own exegetical weaknesses, especially perseverance of the saints. But the same can be said about the distinctives of Arminian theology, especially when you start talking about having an experience of perfection in this lifetime. There are problems matching that up with what the New Testament says about perfection. The same can be said about Pentecostal theology, with its teaching about a second, definitive work of grace, and about dispensationalism, with its teaching on pre-tribulation or mid-tribulation rapture. I show in my book that all of these evangelical theological systems are exegetically vulnerable precisely in their distinctives. Classical Pentecostals need to think about this. One things we talk about the most in our circle is “the Pentecostal distinctive,” which is typically cited as the “Baptism of the Holy Spirit with speaking in tongues as the initial, physical evidence.” This is the Pentecostal distinctive above all others. However, one of the “tags” we’ve long been known by, or called ourselves by at the least, has been “Full Gospel,” as a way of saying, we’re completely dependent on the Bible as God’s revealed will and plan. In fact, at our movement’s inception, at Parham’s prompting of several adult students, the Baptism of the Spirit was experienced as a result of an intensive study of Scripture. Scripture came first, experience and doctrine came out of that. Somewhere, we’ve lost our way. As long as a single doctrine holds sway in our Fellowship as the single Pentecostal distinctive, we cannot be fully reliant on the Scriptures as our guide for faith, doctrine, and practice. We need to maintain our true distinctive, and that is: sola scriptura. Rich, this has been a lovely and enriching discussion. I have not been presented with your argument before, but I am tentatively persuaded. I agree that we hold the doctrine above the Word, in some cases some times. And I agree that our lack of people operating in the spiritual gifts (not just tongues but also prophecy & interpretation) will not be reversed by simply “more Spirit,” per se. I think we seriously underestimate the Holy Spirit’s work. Does He not also lead me into all truth while I sit in a theology class? And I absolutely agree that the point is love. I have been learning, lately, how much it is possible to get everything right and miss the point. As one who has undergone several theological crises, I often wonder what it is that makes one Pentecostal in the first place. Is it that I speak in tongues? Is it that I believe speaking in tongues is of God, or biblical? Is it that I belong, as the daughter and grandaughter of Pentecostals, to a Pentecostal denomination? Or is it that I believe speaking in tongues is the evidence of a secondary work of grace called the baptism in the Holy Spirit (because on this last one I’m not so sure)? I don’t want to put words into your mouth — you don’t appear to be critiquing the doctrine itself. But this issue concerns me. For some A/Gers, initial evidence is the hill they’re going to die on. I know a man, a son of A/G missionaries, that went through the process to be ordained but was rejected because he waffled on the initial evidence issue. I understand this on one hand, but on the other hand, this man then left the Assemblies altogether in order to pursue the calling into ministry God had placed on his life. He was a good man, annointed by the Holy Spirit, and we lost him. Perhaps we need to go back to the question, “What meaneth this?” (Not that I know the answer or that it may be answered easily.) I ask that question again… that we may not sacrifice so much, take such a stand for the sake of the truth, the Holy Spirit’s work, and still somehow miss the point. Quick question: 1/3 of members have experienced the Baptism of the Holy Spirit in a Pentecostal church — is that something recent or has that historically been true? If the number has always been at that level, then Pentecostal churches who promote experience over doctrine will eventually fade away, as people who don’t receive the Baptism will tune out. I would like to think that Pentecostalism has more to do with realizing and enabling the power of the Holy Spirit into the believer’s life. God’s Word promises it, and He is there for our benefit if we only claim Him as our Counselor. I have had to deal with misconceptions about Pentecostals in the past, particularly that we get all “clap-happy jumpin’ and shoutin'” so we naturally can’t get serious about Bible study (emotion over intellect). Bible = ink printed on paper, usually with fancy cover. Word of God = Bible brought to life by the Holy Spirit. Baptism of the Holy Spirit = a special gift from the Lord that gives a disciple more power to minister/evangelize/teach with the talents that the Lord has blessed them. If you want to have a deeper (richer) knowledge of God’s Word, then the Holy Spirit is the one to lead you. The Baptism of the Holy Spirit gives you that much more power to seek His truth and accomplish more. There’s still plenty that you can accomplish without the Baptism, and many have and will continue to labor for the Lord they love. You keep talking about ‘distinctive’ as if its supposed to be something that is a positive charcateristic. But distinctive should be understood perjoratively. Its how pentecostals or calvinists are DIFFERENT from other christians. Many calvinists will accept that lutherans (for instance) are ‘just as good Christians’ and might be more loving, etc, but the ‘calvinist distinctive’ is calvinism. If it weren’t we’d be talking about lutherans. Does He not also lead me into all truth while I sit in a theology class? Yes, and the same happens in your auto mechanics 101 class, or your painting class, or your geophysics class. Who better to illuminate our thinking about anything in this created universe than the creator himself? On the other hand, we have only one objective measurement whereby we can know that we were led to our conclusions and opinions by the Holy Spirit: do our conclusions and opinions agree with the canon of scripture? So, I don’t think I should ever assume that just because I speak in tongues, or just because someone was healed under my ministry, or just because I did “carpet time” last night, that this means that my thinking is, in fact, Spirit-led, Spirit-approved, and Spirit-endorsed. I might be manifesting charismata left and right, but still be wrong in my thinking! But when I’m right, I can know it with certainty, because my thinking will be in harmony with the scriptures! You know the distinction is not a Biblical one: it is modern. Biblically speaking, we are either disciples of Christ, sons of God, the elect, or we are not. The assumption all throughout Acts and the assumption lying behind all of Paul’s thought (especially evident in 1 Corinthians, Romans, and Galatians) is that the promise of the Holy Spirit serving as our Parakaleo was to be embraced universally. To Paul, receiving the Holy Spirit is such a valuable and desirable gift that it is normal to seek it and receive it. It would be abnormal to reject it or ignore it. For some A/Gers, initial evidence is the hill they’re going to die on. Yes, the article I cited above, by James K. Bridges, takes exactly this stance. Having studied the literature and theories about this, I do take the traditional Pentecostal stance (that the only objective, measurable evidence of the Baptism in the Spirit is tongues), but I never want my dogma to sacrifice relationships. There are reasonable, intelligent, men and women who disagree with this stance, and apart from tongues, they do exhibit the other evidences I cited above. And this is where I get stressed out. I believe and endorse the “initial physical evidence” doctrine. That makes me a “Classical Pentecostal” according to the label. But that doesn’t mean I’m filled with the Spirit, walking in the Spirit, or baptized in the Spirit. It just means I give mental assent to a doctrine. And this is precisely where we can go wrong: we can teach the doctrine, preach it, pound it into our congregant’s brains, but the doctrine itself won’t move us any closer to seeing the love, joy, peace, gentleness, goodness, faith, self-control, and etc. and etc. exhibited in the lives of those who hear us rant and rave about physical evidence. Only the transformation and mental renewal of the Word and the attendant work of the Holy Spirit in our hearts, minds, and lives can do that. I remain fully convinced that, more than anything else, Pentecostals–ALL Christians–should be people of the Book first, and denominational adherents second. Quick question: 1/3 of members have experienced the Baptism of the Holy Spirit in a Pentecostal church — is that something recent or has that historically been true? I fully agree with the rest that you wrote, Marc, and there’s no need for me to comment further than that. Thanks. No, Pduggie, I don’t view “distinctive” as a complimentary term. And I disagree that is is by nature pejorative. Distinctive simply points at what makes one thing not like another thing. To speak of “the male distinctive” or its opposite, “the female distinctive” is not to insult neither one. It is merely a way of identifying subsets of a thing based on significant differences. Otherwise, I agree. What makes each denomination distinct should be kept in mind when discussing differences, because that’s where the tension and dialog goes on between “distinctly” different faith-walks. I just don’t see that as an insult. I think I agree with Witherington’s comment (as I understand it) that the distinctives may not always have the biblical and exegetical ground to justify our devotion. And I think it’s healthy to accept this as a possibility and occasionally take a fresh look at the reasons why we believe what we believe. Pentecostals are making a mockery of God’s word. They are hyperimaginative/unstable or perhaps a bit of both. Why do they need to put power under Gods word, I will state the obvious here, is not the Word enough? They ramble on and on and on and on. Tasteless display of emotion. Pentecostalism is simply disgusting. Get a grip people. Linda, it sounds like you’ve been hurt by some Pentecostal leader somewhere, otherwise I don’t understand all the anger you bring to your post. In fact, you seem so angry your comment is nearly irrational. Some Pentecostals certainly do teach outside the bounds of the Word. But some Fundamentalists do, too. And some Evangelicals do, too. Some Pentecostals are unstable, but so are some Fundamentalists, and some Evangelicals. I don’t know what “rambling on and on” has to do with anything, but I’ve seen Fundamentalists given to tasteless displays of emotion as much as the most emotional Pentecostal. Certainly distinctives are not pejorative! And I wonder if Trinitarian Pentacostalism is really that weak on the distinctive of the Initial Evidence, though I agree that many of the folks sitting in the pew can easily be persuaded that there are other evidences of B/HS. On that level, there may be weakness. I would hope that most ministers would not simply sign on to the doctrine for the credential’s sake. there should be some serious study and an actual adherence to the doctrinal distinctive. Linda asked if the Word was enough. Of course it isn’t! Jesus told his disciples to wait for power from on high before proceeding into ministry- that command – to be empowered in ministry- needs to be taken seriously.